It feels like almost every day a new brand of yoga emerges. I’m not familiar with many disciplines of yoga (as Iyengar Yoga is all I’ve ever studied) but I figure there ought to be merit to various approaches. What I find interesting though, is the broad range of practices that all identify themselves as ‘yoga’. I can’t help but wonder… at what point is yoga no longer ‘Yoga’? There’s Water Yoga (practicing yoga in water), Aerial Yoga (combining mat yoga with the use of suspended hammocks), Paddleboard Yoga (practicing yoga on a stand up paddleboard), Ganja Yoga (practicing yoga while ingesting cannabis), and many others. When I talk to people about yoga, I’ve often said that there are so many varieties out there and they are so drastically different, that I’d almost prefer that they weren’t all called yoga. Truth be told, there has always been several approaches to yoga. Even before Patanjali, who formalized the 8-Fold Path that is most common today, there was Hatha Yoga, Kriya Yoga, Kundalini Yoga & Tantric Yoga. Like the various yoga disciplines today, each varied its approach and emphasis. However, there was always a common thread – the underlying goal of pre-classical yoga was (is) to overcome the polarity between the individual self and the Universal Self, in an effort to ultimately achieve spiritual enlightenment. Nowadays, the label ‘yoga’ is used so liberally and I think it’s the lack of this common thread that irks me. At what point is a practice no longer ‘yoga’ but rather more simply, exercise? Specifically, what is it that makes yoga, ‘Yoga’? In case you are reading this and hoping for a definitive answer, I’ll tell you right now, I have not come up with one. I thought though that I might share with you my personal experience of how yoga has served me beyond just exercise. As a student and teacher of yoga I am guided by a moral and ethical code – the yamas and niyamas. 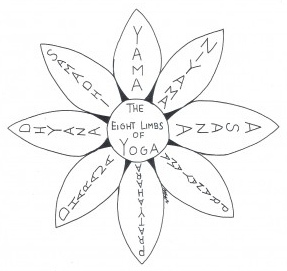 These are the first two limbs of Patanjali’s 8-fold path. I feel I have an obligation to look at my practice through the lens of these codes, and when I do, inevitably, I learn something. In fact, I often think my experience on the mat is analogous with my experience off the mat. Not only does that allow me to learn about life through yoga, but also it lets me practice yoga in my daily interactions. To follow is a brief outline of the 5 Yamas and a thought process I commonly use to bridge my yoga on the mat with my yoga off the mat. Ahimsa/Non Violence. Do I respect my body as I practice? Or, does the goal of achieving the final presentation of an asana trump the messages my body sends? Where else in life might this same attitude of over-doing prevail? Is it harmful? Asteya/Non Stealing. When I practice, do I hold back? Do fear, lack of motivation, self-doubt, or pain take root and end up robbing me of the full experience? Where else in life might ego, insecurities, or self-pity rob me of living out my full potential? Satya/Truthfulness. Do I practice? Do I reflect honestly while in an asana? Do I allow body parts that move easily to take over and thus give the illusion of doing a good pose? Do I allow areas of the body that lack awareness to remain in the dark? Where else in life might I avoid honest reflection? Why? Brahmacharya/Moderation. Do I practice in body but allow my mind to wander? Do I have obsessive tendencies? Do I speak more than I listen? When I teach, do I use unnecessary and extraneous words? Have I ever received a ‘new’ instruction in class only to later learn that the teacher had taught it several times before? When and where else in life might I be ‘missing the point’? Why? Aparigraha/Non Coveting. When I come to class, how aware am I of the other students? Do I compare my practice with theirs? Does this hinder my ability to gauge my progress and development? Where else in life might jealousy and/or covetousness also be a hindrance? Am I attached to outcomes and goals? How does focusing on outcomes and goals affect my experience of the present moment? If you feel at all inclined to share your own personal stories about your relationship with yoga, on the mat and off, I’d love to hear from you! Please post in the comments section below. Very nice post Stephanie! I feel the pendulum will eventually swing and all these new “brands” of yoga will dissipate with the changing tides. The one thing that keeps Guruji’s yoga pure is that it incorporates all people at all levels. Iyengar classes may not be filled to the rafters, but in 10-20 years they will still be around. As far as Ganja yoga and the like? I have my doubts they will be around for a long time. Sounds like just an excuse to run away from something deeper.